We held two events, one in Miami and one in Beverly Hills. Through these events we helped Hermes maximize their investment and reach—by carefully crafting a more personalized experience for the esteemed guests. As their audience is seen as a distinguished group of people have an affinity for Hermes and what the brand represents. Our ultimate objective would be to fully immerse these VIP attendees and keep them engaged in the seamless and magical world of Hermes. Hermes is renown for their spectacular and lavish live events drawing VIPs and extensive media attention. They brought us on to help the 176-year-old luxury brand revolutionize and transform their physical events with a digitally unified brand experience. This project had a specific brand challenge: how could Hermes leverage emerging technology to create an experience as uniquely crafted as their brand? There is no commerce component or product -erchandising component. Our goal was to create experiences that looked and felt like their brand, that gave their guests the whimsical, magical experience they expect from Hermes, and delivered a personalized event experience. We did this by approaching digital craft in the same way that Hermes approaches product craft. In Miami, we celebrated the men’s collection by crafting three sets of RFID-enabled interactive mirrors for a special locker room installation. A unique RFID tag was registered and given to each guest at event check-in. The first mirror encountered by guests captured their image and created a kaleidoscope, splicing it into an "exquisite corpse" effect while playing Hermes runway video in some of the splices. The second experience was a set of three fogged mirrors positioned between two fake showers. The mirrors read guests' unique RFID, greeted them with a personal message and prompted them to write on the fogged mirrors, capturing their notes. Audio of running water and whistling played from both shower stalls while steam drifted out of them. As you wrote or wiped the mirrors clearing the fog, a blurred video of a man showering revealed itself behind the fog. The third mirror captured your silhouette, grayed the remainder of the mirror around your silhouette, and played Hermes video content within your silhouette—prompting you to use your body to reveal more of the video as it played. We had a glamorous opening of the Hermes Beverly Hills location that introduced new interactive magic to the guests. Attendees received RFID tokens that were their keys to unlocking the content throughout the evening, and for saving their digital mementos…like the custom postcards they created on interactive viewfinders…and their personal soundtracks, mapping musical notes to 3D graphics. Tokens revealed the eye candy in surprising peepholes… And allowed guests to record videos of themselves while driving real-time in a vintage Mercedes. Each guest’s digital souvenirs were all captured effortlessly and shareable using RFID and video tracking technologies. After both of these events guests could visit their personal microsite displaying their souvenirs. 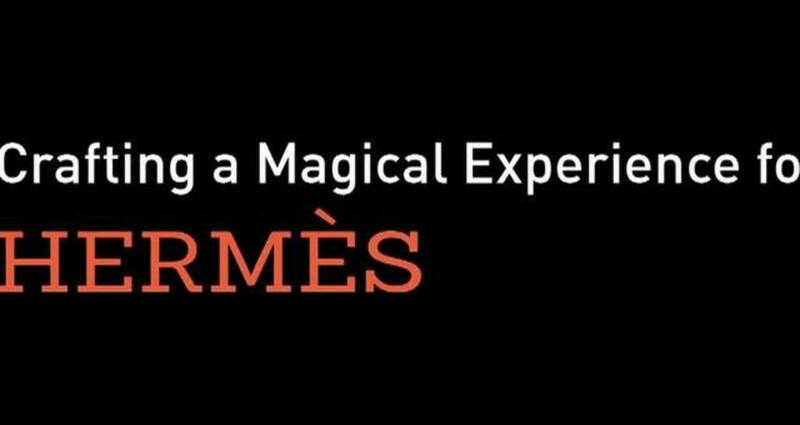 For Hermes, we demonstrated just how digital could help tell magical stories and live much longer than just the event itself.